All Natural, Hand Made Jam from Naples Valley New York. No pantry is complete without a jar of Naples Valley Jazzy Jam. It is a spicy jam that is made using hot red peppers. It's the perfect compliment to cream cheese, which makes it great on a bagel or slice of toast. Serve with crackers over a brick of cream cheese for an instant hors d'oeuvre that tastes amazing. This jam is also great as a glaze for pork and poultry. It even tastes great over veggies, and can enhance the flavor of stir fry dishes too. Your friends and relatives will think you are a professional chef when you use this jam to improve the taste of your favorite foods. Naples Valley Brand Jam is a rich, high quality jam with no artificial ingredients or preservatives. It is the perfect addition to any dinner party or gathering, but is also great to have on hand for everyday use. This great jam is made by hand daily using only fresh, all natural ingredients. You will find that it tastes amazing, and is intensely flavorful. This is the perfect gift for all those pepper lovers out there, but makes a great addition to any fridge. You are viewing the Red Pepper Jazzy variety, but we also carry the Jalapeno Raspberry version too. Click here for details. Choose a healthier jam with outstanding flavor. 11 oz. Naples Valley has been handcrafting quality gourmet mustards for over 15 years. Each variety is made by hand in small batches. This results in an incredibly fresh tasting, and healthy product. There are no preservatives, and each line features 100% natural ingredients. Naples Valley Brand produces a complete line of jams, barbecue sauces, rubs, spice mixes, marinated garlic and stuffed olives. Each and every one is made using the same commitment to wholesome goodness that has made Naples Valley Mustard such a hit with so many families! Order Yours Today! Uses over cream cheese, enhance stir fry, glaze pork, as a dip, etc. Ingredients red peppers, sugar, hot peppers, vinegar, fruit pectin. 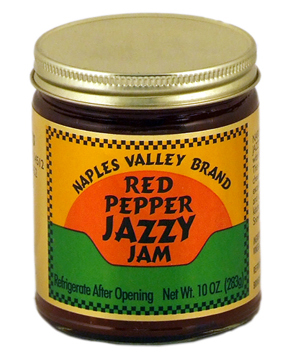 Naples Valley Brand Jazzy Red Pepper Jam - Hand crafted for an irresistible gourmet taste. This all natural gourmet jam will greatly enhance all kinds of food. The perfect gift for all those hot pepper lovers out there. You made it so easy!!! Red Pepper Jazzy Jam is absolutely the best! Whether it's a unplanned get together, or what to bring to a friends house, using a bar, or round of cream cheese with the Jam, poured over the top, is always a hit. I also I have been adding it to my cocktail meatballs recipe. Yum! A bag of frozen cocktail meatballs, one jar of chili sauce, and a full jar of Jazzy Jam. Cook the meatballs in a frying pan for 10 min, throw in a crock pot, then mix the jam and chili sauce, toss on top of the meatballs in the crock pot. Thirty minutes later....done. And it only gets better, as you let it sit in the crock pot.. And believe me, they are a hit!!! Just bought a dozen jars of various jellies, but the majority of Red Pepper Jazzy Jam..Thank you!! One Large And One Small. The Faster, Safer and Easier Way To Flip Meat On The Grill. A Convenient Accessory For Your Borner Slicer. A Versatile Cleaning Tool. Ideal For Kitchen, Bath, Vehicle, Personal Care And More! Reusable and Versatile. Replace Plastic Wrap And Cover Almost Anything! Replacement Squeeze Bottle Top. Don't Get Him A Tissue. Let Him Flavor Your Hot Dog! Large Capacity Manual Chopper For Fast And Accurate Cutting. Turn Your V-Slicer Into A Waffle Slicer. 4 Rings per set. Add rustic elegance to your dining room with natural wood napkin holders.